I think Work of Art from the new catalog might be one of the best sellers this year. It's so incredibly versatile and fun to use. Check out this great card combining Work of Art, with one of my other favourites, Wetlands. I cased the design from a fellow demonstrator in my sideline; putting my own spin on it. I'm really happy with how it turned out. 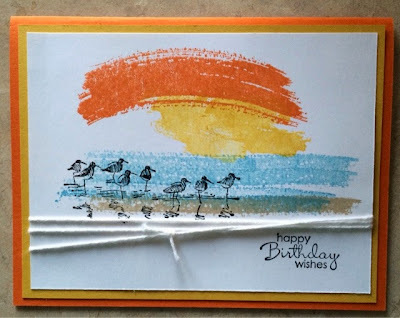 I just love how you can take two completely different stamp sets and combine them to make something beautiful. What stamps sets do you like to combine? Very cute! Now if only my Work of Art stamp set weren't back ordered! Thanks Colleen. Fingers crossed it will come off backorder soon.